I can’t say enough good stuff about Michele watches. I think they’re terrific, and offer so many fun, flirty, girly styles! Michele is a luxury fashion watch maker, geared toward women. A Michele watch will instantly make you feel a bit more glamorous, more fun loving, more in style. Let’s check out some great styles. Ok, with summer right around the corner, how about some really bright and fun creations from Michele? The Tropical Paradise line is just that, and more. I kind of fell for the Tropical Paradise Sea Turtle edition. It comes with a really vibrant turquoise leather strap, which reminds me of the ocean. On the face a sweet tropical scene is being played out. Palm trees are blowing in the wind, the blue oceans is sparkling, and two adorable sea turtles are making their way back to sea, their shells shining in the sunshine. Actually their shells are lit up by 53 luxurious diamonds! All of this is set against a white enamel background. It’s beautiful and tastefully done. The Tropical Paradise line also features a cute monkey grabbing at a bunch of yellow bananas, and a pretty in pink watch, with an underwater view. Colorful tropical fish swim along coral and sea plants. These watches have a summer attitude, do you? 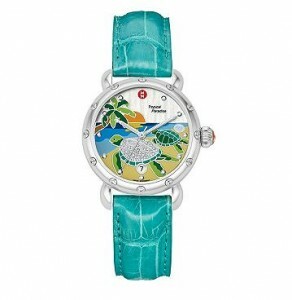 I am very interested in this michelle turtle watch. What is the price of this watch?? Thank you!